Naranjilla fruit is locally grown organically on our farm. One of the main uses of naranjillas is to make juice. It also works well with many other fruits in juices or smoothies. They can also be used in a variety of dishes from desserts like ice cream. Savory dishes is another way to use this fruit, such as in meat stews. 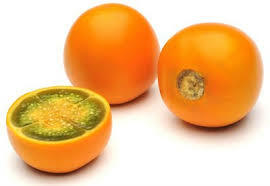 Lulo Fruit or Naranjilla Fruit contains lots of Vitamins A, C, B also iron, phosphorus, beta-carotene, magnesium, and calcium. Lulo is virtually fat free and very low in calories and is very high in antioxidants. Sold 5 or 6 to a bag.